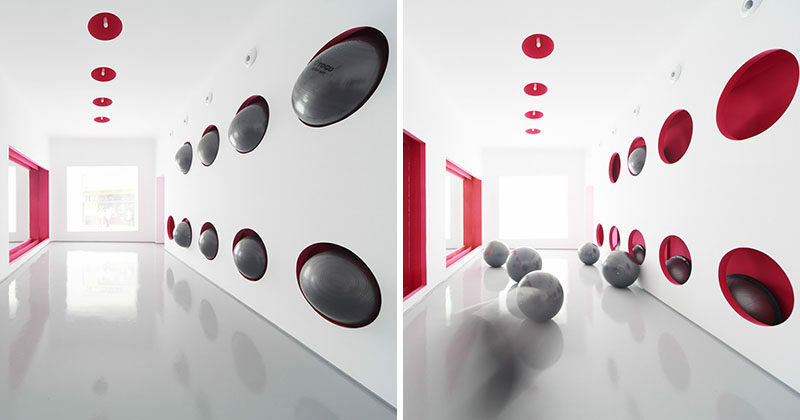 We’ve seen a slot wall in an office designed for storing stools, and now this gym in Spain has created a similar wall for their exercise balls. Designed by CUAC Arquitectura, this physical therapy clinic uses the exercise balls to help their clients, but as the space is small, the designers had to think of a quick and easy way to store the balls. They designed a wall with cut-outs to perfectly fit the exercise balls, and they highlighted the cut-outs with bright pink paint to match the mirror frames, doors, and lighting, all of which are a colorful contrast to the white walls, floors and ceiling.